Looking for the ultimate survival axe? Super heavy duty and ready for nearly any task the TOPS Atax is one tough do-all tool. It’s an ax, a knife, a skinner, a wire cutter, a range finder, a compass, an inclinometer, a clock, a wrench, a hammer, a rescue tool, a survival kit holder, a fire bow bearing, an arrow launcher, a field level. 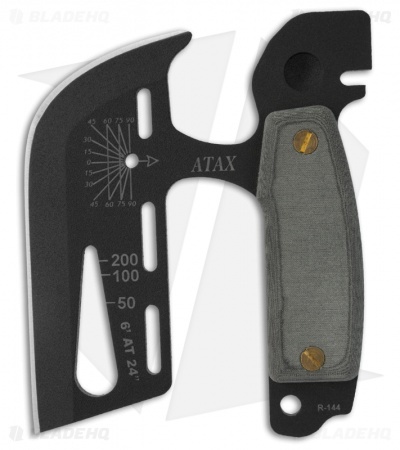 The TOPS Knives ATAX-01 is designed by Ron Hood and features a 4.5” blade of 1095 High Carbon Alloy, hardened to RC 58. The blade is tactical black with a black linen micarta handle. 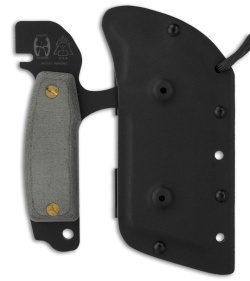 Includes custom form fitted Kydex belt-carry sheath. All hand finished. Also includes instructional DVD by Ron Hood which shows how to use this versatile survival tool.